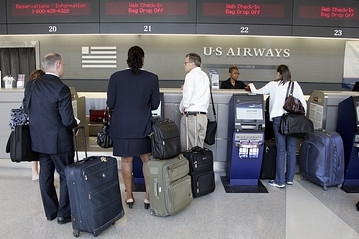 As I passed the US Airways ticketing counter I overheard a conversation between an agent and a customer. The agent said “that will cost an extra $25” to which the customer replied “$25 dollars? !” The customer then went on with some continued complaining of which I ignored in my pursuit for TSA and my awaiting flight. Stage: US Airways ticketing counter decked out in Christmas spirit. Single male customer approaches ticketing counter. Customer places bulky, overweight bag on scale. Cut to logo and friendly tagline. Bags fly free with Southwest!